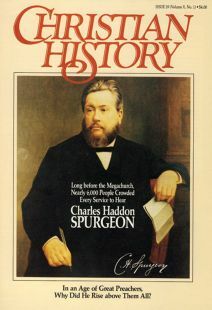 NEXT YEAR MARKS THE CENTENNIAL of the death of the English Baptist preacher Charles Haddon Spurgeon. When Spurgeon died, in January 1892, London south of the Thames went into mourning. Sixty thousand people came to pay homage during the three days his body lay in state at the Metropolitan Tabernacle. A funeral parade two miles long followed his hearse from the Tabernacle to the cemetery at Upper Norwood. One hundred thousand people stood along the way, flags flew at half-mast, shops and pubs were closed. It was a remarkable demonstration of affection and respect, even in an era when people were scrupulous in observing the rituals that accompanied death. Spurgeon died in the same month as Cardinal Manning and Prince Edward. Newspapers and periodicals observed the coincidence with special issues, bordered in black, featuring the portraits of the three men. Manning, a famous convert and a prince of the Roman Catholic Church; Edward, Duke of Clarence, the dull grandson of Queen Victoria; and Spurgeon, the fiercely anti-Catholic evangelical preacher—they constituted a curious mix, even in the pages of the lachrymose penny press. The Duke lacked character or intelligence but was born to great things. Manning, a man of exceptional abilities and powerful connections, had been marked from an early age as one destined to achieve power in church or politics. Charles Spurgeon had none of these advantages of privilege, education, or aristocratic connections. He traveled a more difficult road to his position of eminence, and his is the most remarkable story of the three. Spurgeon was born in 1834, in Kelvedon, Essex, an area with a long tradition of Protestant resistance dating back to the persecutions of “Bloody Mary” in the sixteenth century. His father, John, and his grandfather, James, were Independent ministers. Like many nineteenth-century Nonconformist ministers, Spurgeon was a “son of the manse.” His earliest childhood memories were of listening to sermons, learning hymns, and looking at the pictures in The Pilgrim’s Progress andFoxe’s Book of Martyrs. He would later recommend Foxe’s book as “the perfect Christmas gift for a child,” and it was clearly one of the most significant works he ever read, vividly shaping his attitudes toward established religions, the tyranny of Rome, and the glory of martyrdom. The brave Protestants who were burned at Smithfield, and the valiant Puritans, such as Bunyan, who were jailed for their beliefs, were his childhood heroes. And they remained his heroes and models in the years when he evoked their example to the thousands who came to hear him in the Tabernacle and the tens of thousands who read his sermons each week. For much of his childhood, Spurgeon lived with his grandparents and Aunt Anne in the small agricultural village of Stambourne. There were about five hundred people in Stambourne, a town so remote that even at the end of the nineteenth century it lacked a railroad station. The revolutions in industry and transportation that transformed Victorian Britain were unknown to Stambourne, where the pace of life revolved around the seasons rather than the machine. Spurgeon’s grandfather preached in an Independent meeting house that dated back to the seventeenth century. Ten years after leaving Stambourne, Spurgeon began his London ministry, and for the rest of his life the metropolis was his home. Yet he was never truly comfortable in an urban setting. All his life he continued to return to Stambourne, hoping to find in that tranquil setting some respite from the hectic pace of city life. His roots and values remained those of rural, pre-industrial Britain. Spurgeon expressed these roots and values most notably, perhaps, in his popular John Ploughman’s Talk, Being Plain Talk for Plain People. The fictional character of John Ploughman was modeled upon Will Richardson, a farmer and neighbor in Stambourne; but there was much of Spurgeon as well in the blunt, opinionated, and humorous ploughman. John, like his creator, was a man of the people, with “no trimming in him.” His common-sense wisdom and vernacular wit struck a chord among readers uneasy with the rapid shift from a rural society to an urban one. Spurgeon’s formal education, by nineteenth-century standards, was mediocre. After returning to live with his parents in Colchester, he attended a local school for a few years, and then for a brief time was an usher (or teaching assisant) at an Anglican school in Newmarket where a maternal uncle was a master. He moved to Cambridge in 1850, and he lived in the Cambridge area until he began his London ministry four years later. During his years in Cambridge he combined the roles of scholar, teaching assistant, and preacher. He was briefly tutored in Greek, but his acquaintance with the classics was fleeting in a period in which the undergraduate curriculum was overwhelmingly classical, and knowledge of classical languages was assumed to be the prerequisite to scholarship. As a Dissenter, Spurgeon could not at that time take a degree at Oxford or Cambridge, but there were excellent Dissenting academies and denominational colleges open to him. But Spurgeon decided that he would not seek formal ministerial training. His example was unusual, even among the Baptists. Spurgeon began preaching in rural Cambridgeshire when he was barely in his teens. His first pastorale was in the village of Waterbeach, a few miles from the university. Spurgeon was not average; even as a teenaged pastor in a country town he had star quality. Before he was “the preaching sensation of London,” he was “the boy wonder of the fens.” He was small in stature, and in his youth pale and slim, appearing even younger than he was. His boyish appearance was in startling contrast to the maturity of his sermons, which naturally were strongly influenced by the Puritan works he had studied since childhood. He had a retentive memory and always spoke extemporaneously from an outline. His youth, energy, and oratorical skills, combined with his command of old-fashioned texts, made a vivid impact upon his congregations. People trekked from miles away to hear the preaching prodigy of Waterbeach. Within eighteen months his reputation had spread to London, and he was invited to preach at the historic New Park Street Chapel. The congregation at New Park Street was impressed by the visitor and voted— with only five “nays"—to invite him preach for an additional six months. The 19-year-old country-bred boy preacher moved to the city. In the early years of Spurgeon’s career, he preached in London and throughout the kingdom. No chapel seemed large enough to hold the people who wanted to hear him, and he moved into London’s great secular halls—Exeter Hall, Surrey Gardens Music Hall, the Agricultural Hall—where he preached to thousands. In 1861, his congregation moved to the new Metropolitan Tabernacle, and Spurgeon left London less frequently. The period of Spurgeon’s early London ministry was a period of considerable economic and social distress in Britain. Cholera was a great scourge: Twenty thousand died in 1854, Spurgeon’s first year in London. Also in that year, the Crimean War broke out, the first war involving the major European powers since Waterloo. The mutiny of the Seypoys in India in 1857 provoked a tremendous outpouring of rage and grief, concluding in a National Day of Fast and Humiliation during which Spurgeon addressed the largest audience of his life: twenty-four thousand gathered in the Crystal Palace. These events, with the economic disruptions caused by the outbreak of the American Civil War, brought suffering and economic ruin to many, who sought religious solace in confused and troubled times. Not coincidentally, the 1850s ended with the “Great Revival,” which began in Ireland and Scotland and swept into England, igniting religious emotions in a fashion not seen in Britain since the days of Wesley and Whitefield. Spurgeon disdained the title of “revivalist,” but his ministry clearly benefited from the religious enthusiasm sparked by the events of 1859. Some of Spurgeon’s popularity in the mid-Victorian years can also be attributed to the fact that going to church was one of the few Sabbath diversions permitted in an evangelical household. It is difficult to exaggerate the change for many evangelical families when the Sabbath dawned. Books and papers were put away, games were forbidden, and any secular amusement was out of the question. John Ruskin’s mother, for example, turned all of the pictures in the house face-to-the-wall. For many Victorians, attending a Sunday service—indeed, attending several Sunday services—was a satisfying way to fill the void. Although an evangelical would never attend a theater, he or she could have a theatrical experience by going to hear the young Spurgeon preaching before thousands in Exeter Hall. And Spurgeon was a compelling, charismatic speaker—as his friend John Carlile remembered, “dramatic to his fingertips.” Photographs from this period show him assuming dramatic stances, and visitors’ accounts tell us he seemed to act out the parts, to assume the identity of the biblical characters he spoke of. Before age and gout slowed him down, Spurgeon paced the platform and even ran from side to side. His sermons were filled with sentimental stories that ordinary people could relate to: tales of dying children, grieving parents, repentant harlots, and servants wiser than their masters. Spurgeon’s language was graphic, emotionally charged, occasionally maudlin and sentimental. But great actors, novelists, and preachers of the era appealed to emotions. People cried when Little Nell died and when Little Eva went to heaven. Uncle Tom’s Cabin was the best-selling novel in nineteenth-century Britain. The evangelical appeal to emotions led to the abolition of the slave trade and brought the condition of the child factory worker to the attention of the public. Because of emotional appeals, lives were changed and desperate people were given hope. The dramatic devices employed by Spurgeon have become commonplace now. But they were novel in the mid-Victorian years, and many critics roundly condemned the young minister’s style, manner, and appearance. He was called “a clerical poltroon,” “the Exeter Hall demagogue,” and “the pulpit buffoon.” His ministry was dismissed as a nine days’ wonder, and he was compared to popular entertainers such as Tom Thumb, the clown at Astley’s Circus, the Living Skeleton, and a whole range of fire eaters, flying men, and tightrope walkers who briefly captured the attention of the fickle populace. Other ministers were openly contemptuous of his “sensationalism,” although many would eventually copy his style and even appropriate his sermons. Spurgeon survived the hostile reviews and learned to live with the jealousies of his fellow ministers. He proved to his critics that he had staying power, and he earned the respect of those who had been quick to denounce “Spurgeonism” as a passing fad on a spiritual level with table rapping. In preaching, as in most things, nothing succeeds like success, and when Spurgeon moved his flock into the new Tabernacle in Southwark in 1861, it was fully paid for. The new building could seat six thousand people, and when Spurgeon stood on his platform—he hated conventional pulpits—he looked out at the largest Protestant congregation in the world. In the words of the title of his first biography, he had gone From the Usher’s Desk to the Tabernacle. From all accounts, Spurgeon’s congregation was evenly divided between males and females, which was unusual in a century in which many congregations in Britain and the United States became increasingly female. Spurgeon exuded an air of comfortable masculinity, and women clearly found him attractive. Before his marriage he was deluged with hand-sewn slippers and requests for locks of hair. In 1856, Spurgeon married Susannah Thompson, a member of his congregation and the daughterof a prosperous ribbon manufacturer. She was trim, pretty, and stylishly dressed in the crinolines and bonnets popular in the mid-Victorian years. By her account, it was not love at first sight. She thought the young preacher countrified. But he was a persistent suitor. The Crystal Palace, site of the Great Exhibition of 1851, had been recently dismantled and moved from Hyde Park to the London suburb of Sydenham. Susannah and Charles each bought season tickets. Here, in Paxton’s vast exhibit halls of iron and glass, the two wandered amid the stuffed elephants, monstrously ornate furniture, faux ruins, sewing machines, threshers, and other mechanical marvels and oddities that entranced visitors. It was a suitable Victorian backdrop for a courtship that had all the charm of an old-fashioned valentine. Spurgeon was a public figure, and as a public figure with strong convictions, he was often the center of controversy. This was inevitable, but unfortunate, for those who knew him well believed that he was not at his best in controversial situations. He was an eloquent and persuasive speaker, but he was not a good debater, and he paid a heavy emotional and physical price for his involvement in theological and political controversies. But upon certain subjects—Rome, ritualism, hypocrisy, or modernism—he was incapable of moderation. The tragedy was that in all the controversies in which he was involved, there were good and honorable men on both sides. "The Grand Old Man” of British politics, W. E. Gladstone, four times prime minister of Britain, was Spurgeon’s political hero. Gladstone entered the House of Commons in the year that Spurgeon was born, and in writing to him, Spurgeon referred to him as his “Chief.” The two were much alike: both deeply religious, both emotional and easily moved to tears, both passionately committed to principle. From the 1860s to the 1880s, Spurgeon was an ardent political Dissenter, active on behalf of the Liberal Party and Gladstone. If he did not quite tell his congregation to vote for Gladstone’s party, he came very close. And he did denounce Disraeli (Gladstone’s opponent) in sermons and passed out handbills in support of Liberal candidates. Gladstone attended a service at the Tabernacle, and he invited Spurgeon to dine at Number Ten Downing Street. But when that great man of principle, Mr. Gladstone, became convinced that justice for Ireland meant Home Rule, he split his party and lost Spurgeon’s support. For Spurgeon, Home Rule meant Rome Rule, and in his memory the faggots of Smithfield would begin to glow, and the cries of the martyrs would call him to resistance. Gladstone split his party, and Spurgeon split his denomination. In the 1880s, about the time Spurgeon broke with the Liberals, he began to express fears that some ministers in his own conservative Baptist sect had become tainted with modernism. He worried that these preachers no longer subscribed to evangelical teaching such as scriptural infallibility, the atonement, and eternal damnation. The “Down-Grade Controversy,” as it came to be known, pitted Baptist against Baptist, minister against minister, and even some Spurgeon’s College men against Spurgeon. The controversy darkened Spurgeon’s last years, already made bleak by physical debility, and led to charges by supporters that he had been killed by the controversy and died “a martyr to faith.” Spurgeon withdrew from the Baptist Union. The Union, in retaliation, passed what came to be termed “a vote of censure” on the most famous Baptist in the world. Spurgeon ended his life where he began it, in independency, a man too big to be defined by a single denomination or party. "When our lives come to be written at last,” Spurgeon once wrote, “God grant that they be not only our sayings, but our sayings and doings.” A fair assessment of Spurgeon’s life must include both. He was not an original thinker, and he never claimed to be a theologian. He was a preacher, and in that role he was unsurpassed in his day and not often matched since. His originality as a preacher lay in his combination of old-fashioned doctrine and up-to-date delivery. He may have been an ordinary and conventional Victorian in many of his personal tastes and prejudices, but he had an uncanny ability to sense the pulse of his times, and to know, almost instinctively, how to reach out to ordinary and troubled people in a language which they could not resist. It was the language of the marketplace—pithy, pungent, often humorous, and at once commonsensical and compelling. The power of that language reached a worldwide audience and has kept the name and message of Spurgeon alive long after the embers of old controversies have died out. "I must and I will make the people listen,” the boy preacher said. None did it better. Dr. Patricia Stallings Kruppa is associate professor of history at the University of Texas at Austin, and author of C. H. Spurgeon: A Preacher’s Progress (Garland, 1982). In the High Middle Ages, Christian women found many ways to live a holy life. Where was God in this brutal national war? An unbaptized non-churchgoer came up with a profound answer.